Unless you have problems with eggs — some sulfite–intolerant folks do — here is an easy-to-make summery dish in which I hide eggplant slices inside an omelette. I spread some of my “pesto rosso” (which is really a breeze to make) on the baked eggplant slices in order to spice it up . My Significant Other is not a great fan of eggplant but he has not complained about this dish! – 3 or 4 eggs, depending on size… and your appetite! You will also need a large frying pan and a large lid to cover the pan. 1. Wash and slice the eggplant, lengthwise. Each slice should be about 1 cm / 1/3 inch thick. Lightly brush each side with the seasoned olive oil. Bake for half an hour, turning over the slices after 15 minutes. 2. Beat the eggs into an omelette, season to taste, keeping in mind that the pesto will add saltiness to the dish. Cook the omelette in a large, lightly greased frying pan (oil or margarine may be used), covering it after a few minutes so that the top will be cooked also without having to flip the omelette, an action not recommended for clumsy people like me! Remove from heat. 3. Arrange the baked eggplant slices on the omelette so as to cover as much surface as possible. 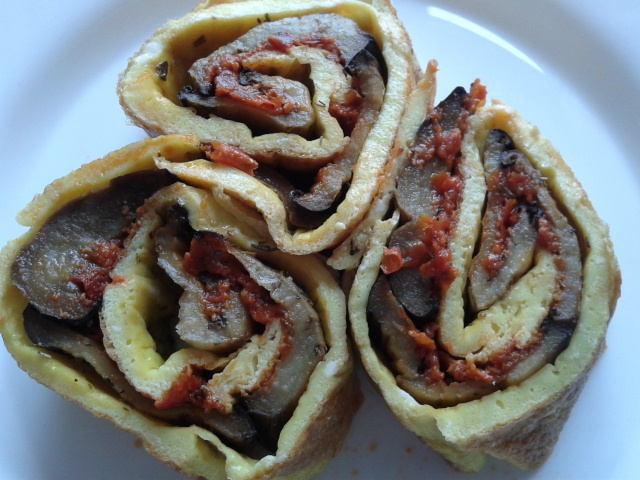 Spread the pesto on the slice, gently roll the omelette and carefully transfer to a serving dish. Serve immediately. If you want to have some starches with this dish, feel free to serve it with rice, or, like me, millet cooked with fresh tomato cubes. As always in my case, the dish tastes better than it looks: I am such a lousy photographer!